Noah broke down a few of the parts of the testimony that have becom media soundbites. “Black people wouldn’t vote for you, Trump, because they’re ‘too stupid?’” Noah said, quoting Cohen. The weave referred to whatever it is that nests on Trumps head. 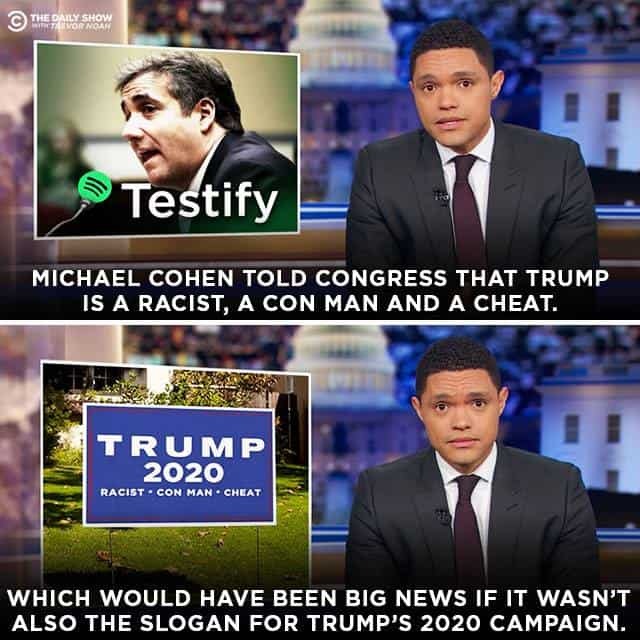 “Now, in response to Cohen’s racism accusations, the Republicans on the committee put forward an airtight response to prove that Trump is the least racist person you will ever meet,” Noah said, referring to the way Rep. Mark Meadows (R-NC) trotted out Lynne Patton, a Black woman who works for the Trump Organization, as a literal prop said The Daily Beast. Patton did clapback about the accusations that she was a prop, saying in part that she came there not to “represent an entire race of people. I was there to represent one man,” Patton told Fox & Friends on Thursday, touting Trump’s economic record and what those gains have meant for black Americans.